Where Can I Safely Park My Bicycle in Kannapolis?! 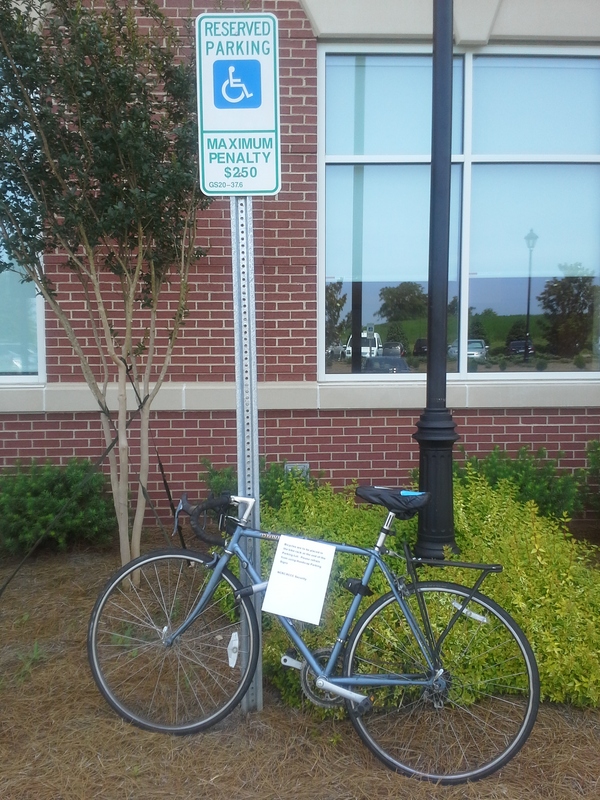 Where can I safely park my bicycle in Kannapolis?! I wish the answer was as simple as to a bike rack! Unfortunately, as I find out on a nearly daily basis because I bike in Kannapolis nearly every day, there are very few bike racks in Kannapolis. 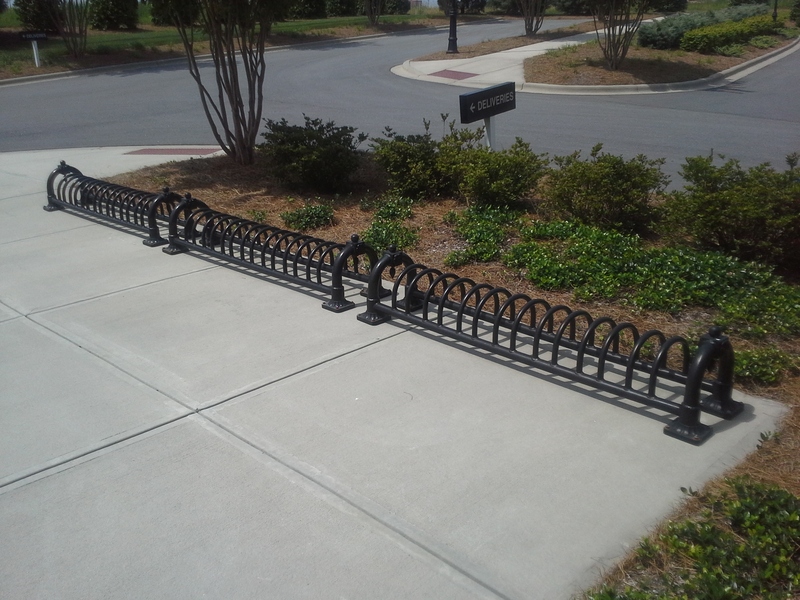 From what I have observed, I believe these few bike racks, which have all been poorly designed, are almost all located on the North Carolina Research Campus (NCRC), which is located in downtown Kannapolis. While I haven’t biked every street in Kannapolis, there are very few other locations in Kannapolis that have installed bike racks. When I have found other bike racks, almost all of them have been poorly designed. Feel free to share with me additional bike parking locations in Kannapolis so I can photograph and discuss them for a future post. Even though there is an extreme shortage of bike parking, especially bike parking that is designed correctly, there is extremely too much automobile parking! While I will provide a short overview of automobile and bike parking in this post and the other posts included in the series, I plan to devote additional blog series to automobile parking and bike parking at a later date. This later date will most likely be after I leave Kannapolis. 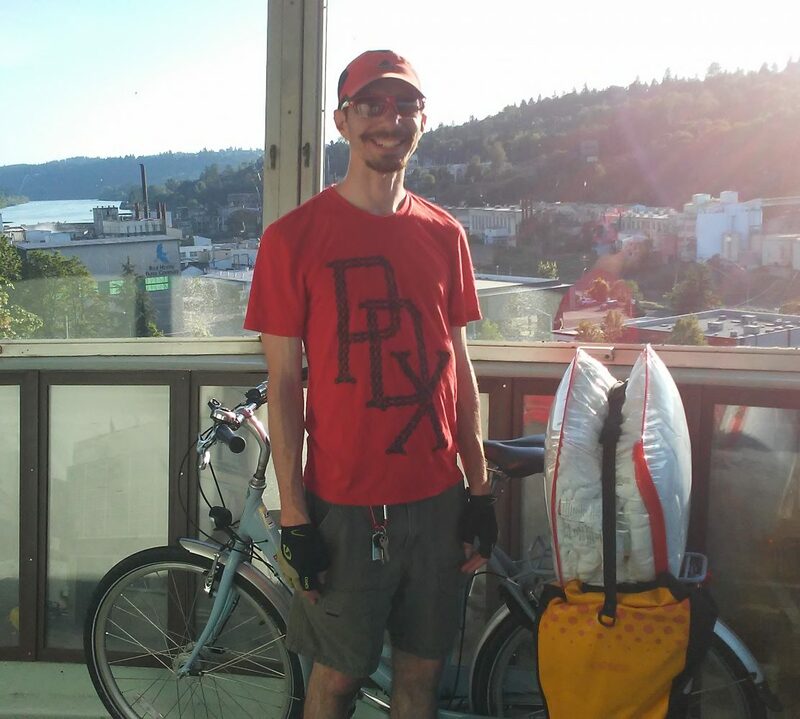 After I finished writing about just one issue I experienced while biking today, I was already up to over 1,200 words. I’m not sure how many words is too long for a blog post. Can anyone experienced with blogging inform me what the accepted maximum word limit is for blog posts? I assume people don’t want to read more than 1,000 words in a single blog post so I will split the issues into several blog posts. I also need to prioritize my statistics and microeconomics homework above blogging so this gives me another reason to split the issues into several blog posts. This post will be devoted to discussing my experience today with bike parking at Rowan-Cabarrus Community College (RCCC)’s NCRC Building. The rest of the blog series will discuss bike parking at UNC Chapel Hill’s NCRC Building and the sharp contrast between the available automobile parking and bike parking on the NCRC. Without further ado, I will begin to discuss the issues I experienced today at RCCC’s NCRC Building. Since my dad starts work at 8am Monday-Friday and my statistics course starts at 8am Monday-Friday, we truckpool most days. It is nice that his office is located one mile east of the NCRC so dropping me off is on his way to work. On the days that we truckpool, I leave my bike in the back end of his truck and usually meet him for lunch after class to pick up my bike so I can bike throughout Kannapolis to do my errands. We decided to change this plan today, which resulted in the issues that are being described in this post. Instead of keeping my bike in the back end of his truck, I removed it and locked it to the handicapped sign shown below. I realize this is not the correct location to park my bike. However, the correct location (not correct design) is shown below. Notice how no bikes are parked here. Either cyclists are parking somewhere else, which is highly unlikely because, according to the US Census Bureau’s 2012 American Community Survey, 0% of workers 16 years or older commute to work by bicycle in Kannapolis, or I am the only cyclist trying to find a safe location to park my bike. This may explain why no one has asked for the safety issue to be resolved. Even though RCCC and/or the NCRC probably received Leadership in Energy and Environmental Design (LEED) points for installing wheel bender bike racks at this building, I cannot safely use the three installed wheel bender bike racks. 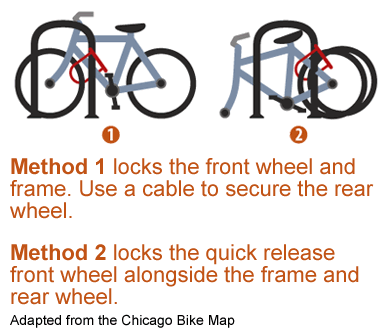 The wheel bender bike rack design is unsafe because I cannot lock the bike rack with the front wheel and frame of my bike using my U-lock. Even though a wire lock would lock my front wheel and frame, I will not use a wire lock. This is because wire locks have been proven to be cut easier than U-locks. I value the safety of my bike more than using an inferior product. Will RCCC or the NCRC install safe bike racks to replace the wheel bender bike racks? Before RCCC or the NCRC installs new bike racks, they need to know one of the many safe bike rack designs that exists. As the below photo shows, an inverted U bike rack is a safe bike rack design because cyclists can lock their lock to their bike’s front wheel and frame. As added security, the inverted U bike rack allows for the rear wheel to be locked to the bike rack. I plan to email this blog post to the City of Kannapolis to find out if they can replace the wheel bender bike racks. I will update you on what they say. You may have seen a note taped to my bike in the first photo. The below photo shows what the note says. In case the photo does not show, the note says, “Bicycles are to be placed in the bike rack at the end of the Parking Lot. Please refrain from using Handicap Parking Signs. 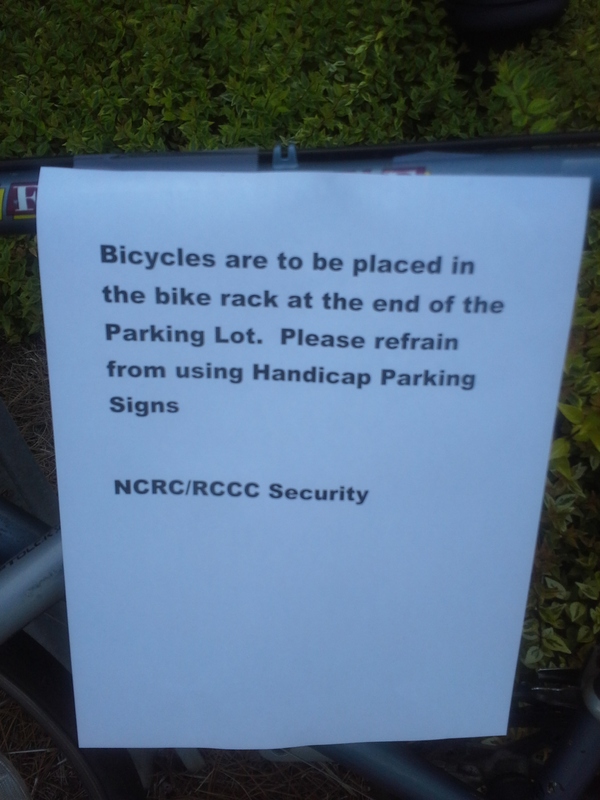 NCRC/RCCC Security.” When I asked security about my safety concern with using the bike parking they directed me to, they said the president of RCCC didn’t like the appearance of having a bike parked there so wanted it removed. After I informed security that I couldn’t safely lock my bike to the bike parking they directed me to and needed them to direct me to a safe and convenient location to lock my bike, security kept responding that I had no choice but to lock my bike to the provided bike parking. I wasn’t willing to take this answer, especially since motorists have safe and convenient parking locations, so I kept pushing. They informed me that if I continued to lock my bike to the handicapped sign, someone would give me a ticket. After explaining the safety issue again, they informed me they would try to remember not to give me a ticket and suggested I come to them (hopefully the same security officer will be on duty) if I receive a ticket. Even though I still have concerns with their answers, I didn’t want to risk getting arrested for arguing with a security officer. Why do cyclists have to deal with this much difficulty to just have a safe and convenient location to lock their bike?! As my next blog post will discuss in more detail, this dangerous bike parking design is not limited to RCCC’s NCRC Building. Since it is easy to bike between RCCC’s NCRC Building and UNC Chapel Hill’s NCRC Building, I often bike over to the Lettuce Eat Cafe, which is located inside UNC Chapel Hill’s NCRC Building. My next blog post will discuss the bike parking and possibly automobile parking (if I don’t go over 1,000 words again) issues I experienced at UNC Chapel Hill’s NCRC Building.